Our Builder / Architect / Designer community is opening B/A/D Talks to the public for Boston Design Week. Our third B/A/D Talks season aims to continue to offer a forum that encourages engaging, transforming conversations among the professionals in our community. What Makes a Good House. . .and Why? B/A/D Talks will open its doors to all lovers of home and design as a part of Boston Design Week. We had a full house for our February 18, 2015, B/A/D Talks. Getting Paid was the topic. The discussion was lively and meaningful. The new season for B/A/D Talks began with a vibrant evening of conversation on October 22, when we examined Ego and Power in Design Projects. 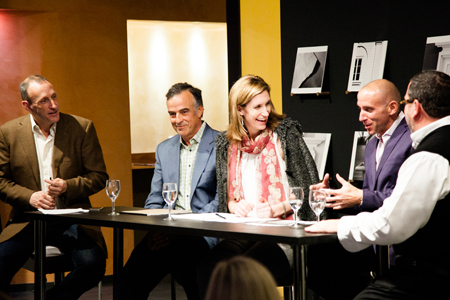 Kyle Hoepner, B/A/D Talks' amazing moderator, was joined by an excellent team of panelists: Tom Catalano, Catalano Architects, Allison Iantosca, F. H. Perry Builder, and interior designers David Nault and Paul White of Weena and Spook. Kyle wrote this intention for our talk: "It can be a touchy subject, but few professionals who have been involved in home design are unaware of the struggles over creative control and client access that can lurk beneath even the most apparently placid team collaborations. At this B/A/D Talks we hope to tackle — in an open, honest, and positive way — how architects, interior designers, custom builders and others involved in residential projects can most productively understand and work through these issues." KR+H's Paul Reidt said the sign of success was how the talk (unlike a presentation) was highly conversational with lots of interaction between the speakers and the audience. The talk was open for conversation with colleagues who attended, making for a lively evening. Paul also noted it was fun to see our colleagues enjoying themselves so much! In fact, so much so that it was a bit of a challenge getting the actual talk started, and many lingered well after the talk for continued conversation. Tom Catalano in conversation with KR+H's Kevin Thibeault. Paul Reidt and I are thrilled to be co-producers of B/A/D Talks with John Kilfoyle of United Marble Fabricators and Kyle Hoepner, Editor-in-Chief of New England Home magazine.